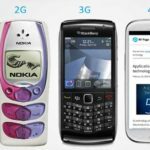 Smart devices are exponentially growing in numbers every year and the requirement for ultra fast data is also inevitable to support huge number of devices and applications. Our existing wireless technologies using radio waves has many limitations due to frequency, bandwidth and it is highly vulnerable to security. What is Li-Fi technology, working principle and what are the applications? Light Fidelity is a high speed data transmission technology first introduced by Professor Harald Haas in 2011 during a TED talk. Li-Fi uses visible light as a transmission medium for data communication between devices. In digital transmission system, data will be converted in to binary bits in the form of zeros and ones equivalent to ‘on’ and ‘off’ states. Visible light is an ultra fast electromagnetic wave with unlimited bandwidth to utilize. High speed switching of light can’t be detected by human eyes but highly sensitive photodiodes can efficiently detect the modulation of light interact with the detectors. Compared radio waves used in conventional wireless systems, visible light has thousand times higher bandwidth. Unlimited bandwidth makes it one of the most efficient solutions for data-intensive applications. Li-Fi technology is fast, full duplex and bidirectional communication system capable of data rate upto 224 gigabits per second. 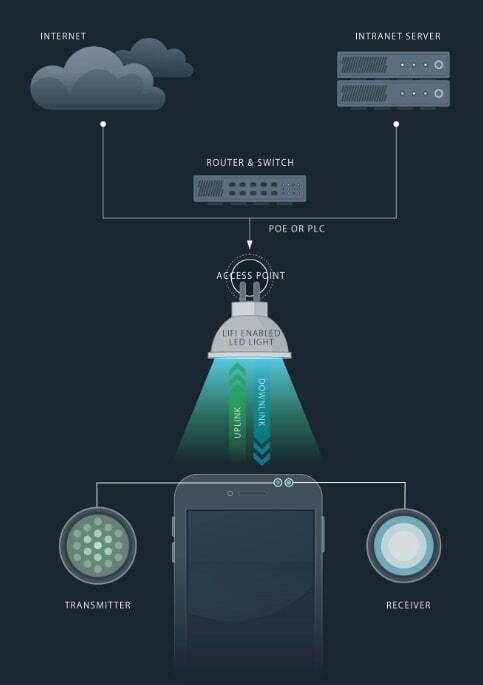 Data access point connects the Li-Fi enabled data transmission system with internet via high speed router and switch. Basically it acts as a smart hub which establishes connectivity between Li-Fi enabled devices and internet. Higher level modulation schemes and encryption techniques are being used to ensure secure communication. Since the light source used in Li-Fi technology – LED bulbs are semiconductors, the same light can be used for transmitting data with fast switching of LED light according to high end modulation schemes. Sophisticated transceiver act as light source (for visible light) and data transmission node capable of sending and receiving high speed data securely. Visible light is the medium for high speed uplink and downlink transmission. A Li-Fi enabled smart device has a photo detector (works as receiver) and light emitter (works as transmitter) for uplink and downlink. Once the device moves from the vicinity of one light source to another light source, the system re-establishes the connectivity like the traditional cell concept. Currently, our smart devices are not equipped with light detection sensors and transmitters. 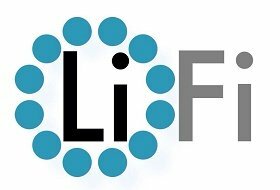 With modern semiconductor technology, Li-Fi can be integrated into a chip easily add into future smart devices. PureLiFi and Philips are the notable names in research of Li-Fi technology. Smart dongles with Li-Fi technology are available for personal computers and other accessories like printers. Despite the fact that Li-Fi is an efficient, fast and cost effective technology, more research and development has yet to be done in this area before we have a flexible solution. 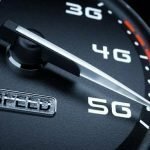 Due to higher demand for high speed data, many wireless technologies are evolving and emerging. Li-Fi technology also has huge potential due to its efficient and cost effective nature. thanks for introducing the working and application of this new Lifi technology. lifi is visible technology and its better than wifi because of its application and its speed.